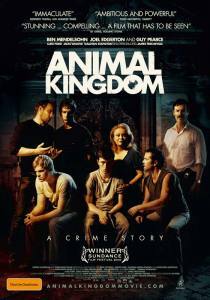 Animal Kingdom is one of the best movies of the year. It’s not a big budget Hollywood movie with fancy effects and an all star cast. It’s an Australian movie, and the actors are basically unknown (with the exception of Guy Pearce). First time writer/director David Michod does a fine job, and I can honestly say that I was very impressed. It’s the story of a 17 year old boy who, after his mother dies of a drug overdose, moves into his grandmother’s house, only to find out that his entire family is involved in criminal activities. A local cop (nicely played by Pearce) thinks he can save him, but it’s no easy task. Before this movie gets lost in the shuffle, I suggest you check it out; it might not be a box office hit, but it’s the most powerful movie I’ve seen all year. I forgot to mention it on my list of best movies of 2010. U should check it out. It’s very good!